Growing up on his family’s farm in North Central Kansas, Caleb acquired his love for the outdoors and his hard work ethics at a young age. He continued to live out these passions into his adult life. 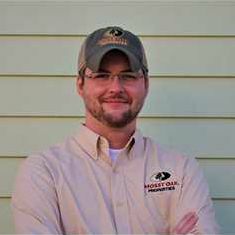 When the opportunity came for Caleb to join the Mossy Oak Properties team, it was a no brainer. His love and passion for the outdoors, his hard work ethics, and drive to help people, all came together. Caleb enjoys spending time in the deer woods and on the waters of North Central Kansas. When not in the woods or on the water, he spends his time with his beautiful family. Caleb and his wife Kristi have two children, June and Dierks. Whether you're looking to buy or sell, give Caleb a call anytime and he’ll be happy to answer your Kansas Land questions!